They say your 50s are the new 30s. I’m not sure who ‘they’ are, and why exactly they say that. But just Google “celebrities in their 50s” and you’ll see that maybe they are on to something (Halle Berry and Tom Cruise, amirite?). Well, this year marks 55 years of the TAG Heuer Carrera, and the motorsport-inspired collection is looking good. 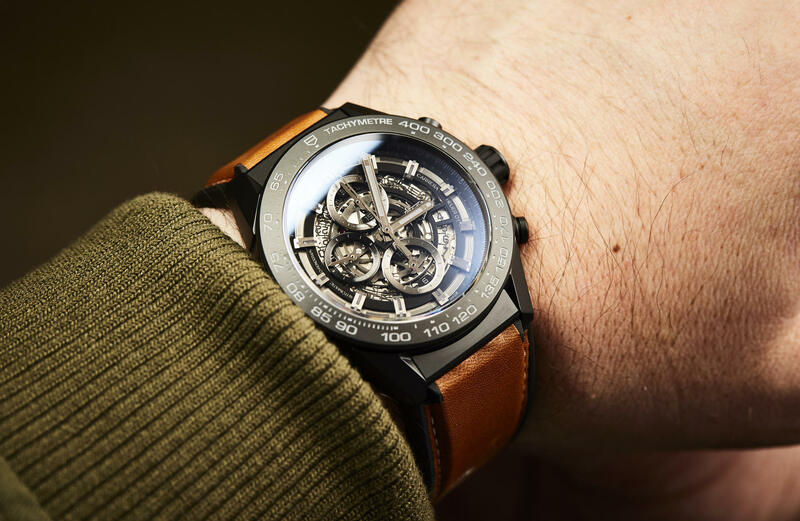 Never before has it been more diverse or all-encompassing, featuring everything from sporty three-handers to GMTs, tourbillons, and, of course, chronographs. The Carrera Calibre Heuer 01 is TAG Heuer’s modern take on their original racing chronograph. 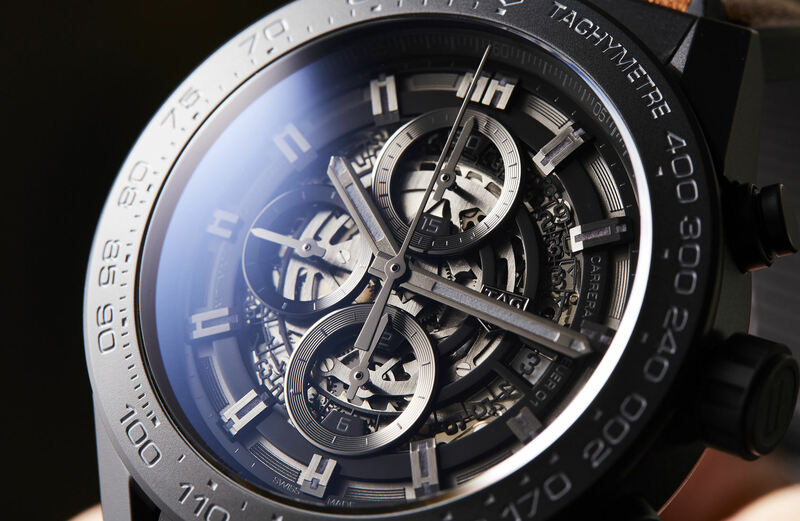 And this version really lives up to the Swiss brand’s Techniques d’Avant Garde (TAG) label, taking things to the next level, with its blacked-out ceramic case. That’s right, this is no PVD coating. 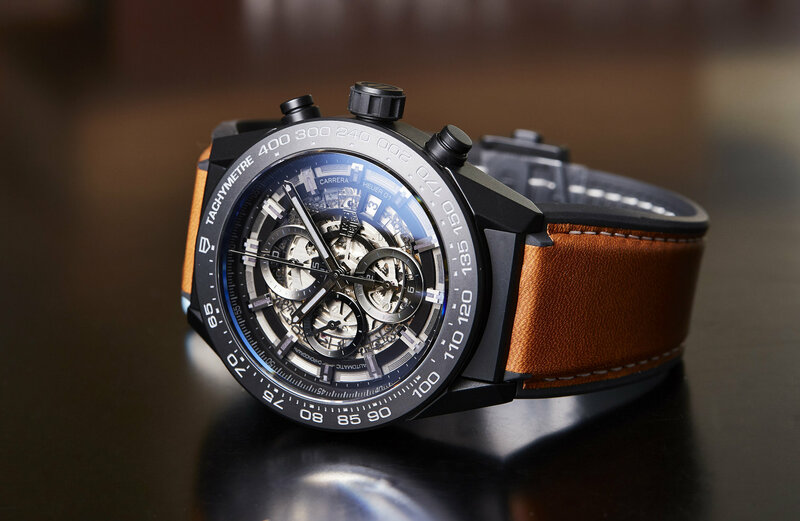 Instead, this Carrera Heuer 01’s modular 45mm case – including its tachymeter marked bezel, and sharp-edged lugs – is crafted in matt black ceramic, providing a stealthy edge to the bold collection that has already proven to be a favourite amongst the sporty offerings of the TAG Heuer catalogue. Ceramic also means that this Carrera is lightweight and virtually scratchproof. Pair that with a water resistance of 100 metres, and what you get is one tough option for your everyday. 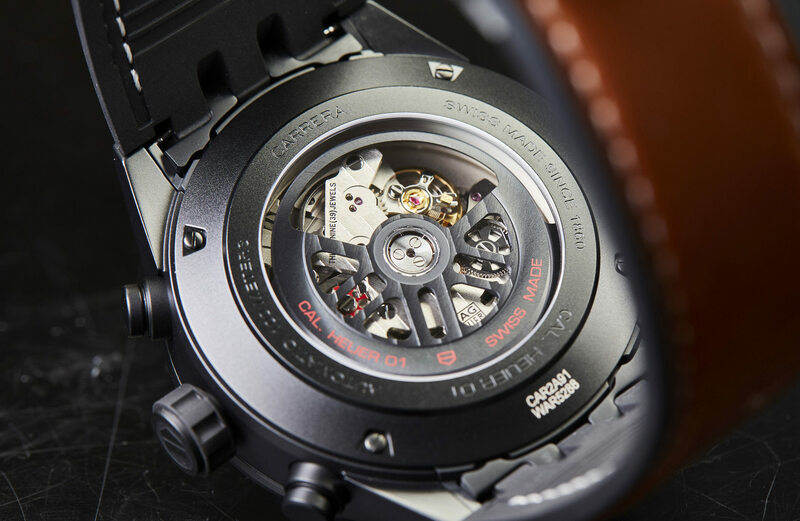 If you’re already familiar with other versions of the Carrera Heuer 01, then you’ll instantly recognise the skeletonised and highly technical dial, which, like the case, has been blacked-out, with the only contrast coming from its varying finishes and the way in which they interact with the light that floods in through the domed and bevelled sapphire crystal. Illuminating – if you haven’t already guessed – TAG Heuer’s own integrated column wheel chronograph, the Heuer 01. With its power reserve of 50 hours – or 40 hours if you like to keep the chrono running. While there is another option that offers an all-black ceramic bracelet, this version adds the earthy tones of a brown calfskin leather strap with a sweat-resisting rubber back. All things said and done, what’s on offer is an incredibly attractive little package. For a little over $8k, you get a ceramic-cased in-house movement, with ultra-modern styling and the added heritage of one of the great automotive-inspired chronographs.